A koilocyte is a squamous epithelial cell that has undergone structural changes as a result of infection by human papillomavirus (HPV). 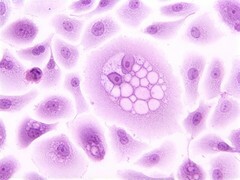 This image of a koilocyte shows human ectocervical cells (HEC) expressing HPV-16 E5 oncoprotein, and immortalized with HPV-16 E6 and E7 oncoproteins. Formation of koilocytes requires cooperation between HPV E5 and E6 oncoproteins. The cell culture is stained with hematoxylin and eosin (H&E).